The Sea Shepherd Conservation Society has renamed one of the vessels that helped chase the entire Japanese whaling fleet out of the Southern Ocean Whale Sanctuary earlier this year in honor of Brigitte Bardot. Sea Shepherd Founder, Captain Paul Watson, made a proposal to the Brigitte Bardot Foundation to rename the Gojira the Brigitte Bardot after the dedicated animal rights activist. The relationship between Brigitte and Paul goes way back to 1977 when Captain Watson took Bardot to the ice off the coast of Labrador to pose cheek to cheek with a baby seal. 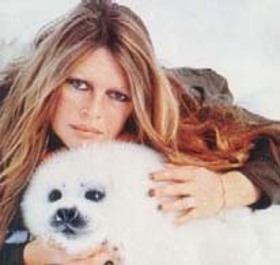 With that one iconic photo alone, Bardot brought the cause and need to protect harp seals to the world’s attention, a pivotal point in the fight to stop this annual Canadian obscenity of cruelty and mass slaughter. Sea Shepherd and the Brigitte Bardot Foundation have worked together in partnership for many years, recently teaming up in an effort to end the barbaric slaughter of pilot whales in the Danish Faeroe Islands. And thus, the newly painted Brigitte Bardot is now part of the Sea Shepherd fleet joining the Steve Irwin and the Bob Barker in the organization’s ongoing campaigns to defend life in our oceans from illegal exploitation by high seas poachers. Captain Albert Falco, the legendary oceanographer of the Cousteau Society, broke a bottle of champagne on the bow of the Brigitte Bardot to officially launch the vessel under her new name. The ceremony was attended by Sea Shepherd crew and staff, along with members of the Brigitte Bardot Foundation, and the media. “It’s a beautiful ship with a beautiful name and it is a vessel that will reflect the compassion of Brigitte Bardot in partnership with the passionate interventionist direct action tactics of Sea Shepherd,” said Captain Watson. The Brigitte Bardot will head to Libyan waters within a week to track down bluefin tuna poachers taking advantage of the war zone to illegally exploit these endangered fish. 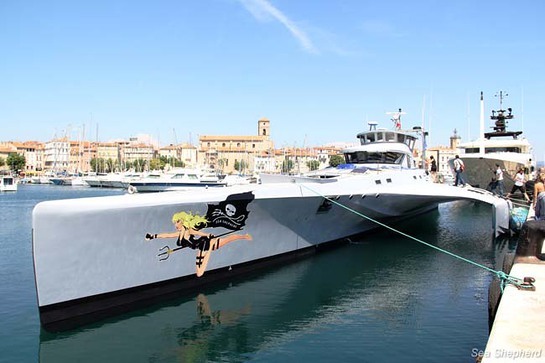 The Brigitte Bardot will be joined on this campaign by the Sea Shepherd flagship Steve Irwin.